Contemporary air-conditioned office suites available in modern business centre located in lovely park off M42 (J5). 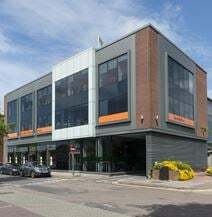 Attractive building housing business space with full services from reception and support staff, kitchen facilities and café, to hi-tech IT solutions and meeting rooms available as and when required. Centre enjoys easy access to M40, M6, M5 and Birmingham International Airport, offering onsite parking to occupants. Ideal for technology and knowledge-based businesses and managed by the University of Warwick Science Park, this flexible office space ranges from 291 sq. ft. up to over 2,000 sq. 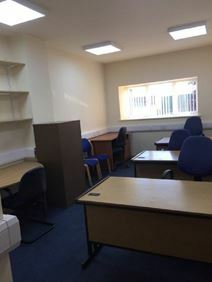 ft.
Well-equipped business centre containing up to 40 rentable units available in heart of England area adjacent to M42 in Blythe Valley Business Park in vicinity of Shirley and Solihull commercial centres. Building is up-to-date and semi-serviced for tenants. Birmingham, Coventry, Warwick and Stratford are in the surrounding areas with excellent access by rail and car - the site enjoys motorway links to the M40, M1, M6, M5, M45 and M69. There is a Tesco superstore 1 mile away and the NEC and Birmingham International Airport and Rail Station are also nearby. Based in the heart of the Cranmore business area of Solihull and with easy access to the M42 this modern, secure and fully furnished office space provides options for four to six workstations. Kitchen and breakout areas are available while a one-month notice period allows for great flexibility. Solihull's Cranmore Business Park has high standard, fully-fitted flexible office hire with a range of sizes of suite catering for small to large companies. Well-located noticeable position with good transport access to both Solihull town centre providing local amenities, and to Birmingham International Rail Station and Airport as well as M42 motorway via J4. Convenient fully-inclusive package prices from 3 months+, incorporating furnishings, telephone & data systems, service charges with building manager, utility rates, cleaning service and onsite fitness centre membership. Close to Solihull and Shirley town centres this newly renovated flexible workspace has fantastic motorway access and car parking options. Inside the fully furnished offices are air conditioned and secured for privacy. The centre also provides an on-site cafe ideal for a quick working lunch. This Grade A modern office building has a great location in the Solihull area and the M42 corridor. The site has secure car parking to the rear and a modern boardroom available for hire on the ground floor.